Staying busy, and staying focused, is something I admire greatly. One of my college basketball coaches once told me, "Al, you've got to be mentally tough to excel at this game, you gotta focus, man." Alas, he may have been picking up on one of my weaknesses - staying "in the moment" long enough to make excellent decisions. Poker players learn to do this, or they learn to flip burgers. In the 1970's, every one of the $10,000 World Series of Poker Champions came from the south, and most of those were from Texas. It must have been something in the water down there. Like Doyle Brunson, Sailor Roberts and Jack Straus, Bobby Hoff was a college athlete in the 1950's. Fresh out of Victoria, Texas, Bobby won a golf scholarship to play for the University of Texas in 1958, but like his fellow Texans, he found that poker was easy - and lucrative. And like so many other players, he was certain that he was a terrific poker player. Golf fell by the wayside. Bobby realized he wasn't quite as good a poker player when he stepped foot off the University, and when his winnings were gone, he got a job as a dealer in a local casino. Each night when his shift ended, Hoff would find a poker game and play until he was exhausted, or his bankroll was. After reading Edward O. Thorpe's book, Beat The Dealer, Bobby and a friend started playing blackjack. They learned the 10-count, and watched as their bankroll rose and fell at the whim of the cards. One night that bankroll reached $10,000, but by morning, Bobby was drunk, busted and disgusted. The same thing happened a few months later in Reno. Up, down, way up - busted. It's a hard life, living on gambling winnings, especially if you have a compulsive nature. Bobby was able to save some serious money after he forming a blackjack team with a well-staked player from Corpus Christi, Texas. After nearly five years of play, the team found it all but impossible to get a decent game in Las Vegas (or even Reno or Lake Tahoe), without getting shuffled-up on or being barred. The Horseshoe Casino in downtown Las Vegas had just put in a poker room, and Bobby began playing seriously again. He ran into some of the better players of the time, and eventually his six-figure bankroll was just a faded memory. Fortunately, his best friend, Sailor Roberts, staked him in other poker games, and Hoff began to beat the local pros. The games were good, if you didn't mind sitting at the table with players like Doyle Brunson, Johnny Moss or Puggy Pearson. Since the early 1960's there had been an exodus of top pros to Las Vegas (ever since Felton "Corky" McCorquodale introduced the game of hold'em there), but W. C. Fields may have had a premonition about the games when he said, "Never give a sucker an even break," and there were plenty of suckers in those games. Poker author and professional player Bob Ciaffone, calls Bobby Baldwin "brilliant, a pure player, very polished," and while Hoff says he learned a lot about poker from Doyle and Sailor, but he calls Bobby Baldwin the best no-limit player he ever saw. Baldwin was coming off a win in the championship of the 1978 World Series of Poker when the 1979 series started. After three days of play, the field was reduced to just eight players: former champions Johnny Moss and Bobby Baldwin; and challengers Crandall Addington, Hal Fowler, George Huber, Sam Moon, Sam Petrillo, and Bobby Hoff. Hal Fowler was the short stack, but it was Baldwin who left the final table first when he flopped a set of eights only to be beaten on the river by trip aces held by Sam Moon. That hand set the mood for things to come. 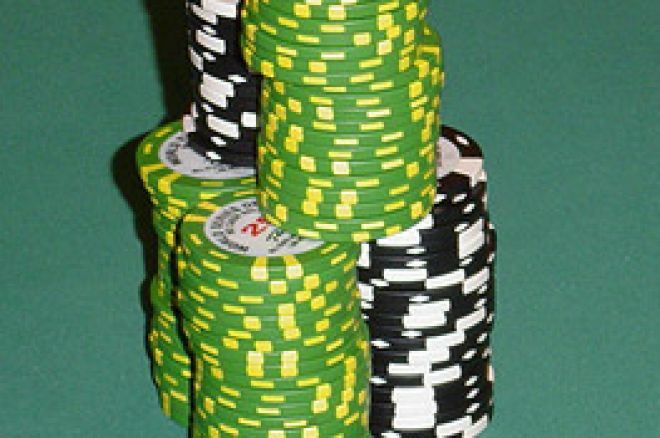 A quiet public relations expert from Los Angeles, Hal Fowler, began accumulating chips at an alarming rate. His runner-runner flush draw took down a pot; his baby pocket pair tripped on the flop and won; his ace-10 held up for high hand. It was a rush that had started three days earlier. By the time the play was heads-up, Fowler was taking Valiums like candy, and he was certainly relaxed. He and Bobby Hoff fought for over ten hours, the lead changing subtly every hour or so. Two hands stand out in Hoff's mind from the dogfight. The first saw him with a chip-lead of about $150,000 when he got Fowler all-in with a pair of jacks to Hoff's queens. However, a river king paired Fowler's kicker and won him the pot. Later, Hoff made a preflop raise with pocket aces. Fowler called with 7-6 offsuit. The flop was jack-three-five, giving Hoff top pair, and he bet half his stack. It wasn't enough to scare off Fowler, however, and when a gut-shot four hit the turn, he took down the rest of Hoff's chips and won the championship. Bobby found no solace in his prize money of $108,000, and his quest for a gold bracelet still haunts him. He finished 25th in the 1993 $10,000 WSOP final, sandwiched between Chip Reese and Mike Sexton, but his 1979 second-place finish remains his best WSOP performance. There have been plenty good days since then, and The Wizard continues to play poker in Los Angles and at tournaments across the country. The next time I see him on television, I hope it is as the final player standing at his most recent tournament. Ed note: Party Poker have multiple tables available at every limit, 24 hours a day.